dude, you're so behind, I already have all their albums. I've heard some of their stuff, it's nothing to fawn over. I've never heard of them, but I'm open to new music. the band name is so stupid I would never, ever even give them a chance. eye deenk Ima gunna lyke dis. 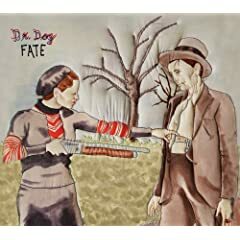 I don't know how Dr. Dog has put out a few albums and I totally missed it. My $1 a year Paste subscription did me well - they had an early review of the album and listed comparisons to The Beatles, Beach Boys, and Rolling Stones, so I had to at least listen to sound clips of what they'd done on Amazon...and it sounded great. I just got the album today and have listened once through, so I can't go into very much detail, but if you love 60's music, multi-layered harmonies, that kind of stuff, you should really check them out. I believe they have two singers, so if you listen to clips and wonder how one person can vary their voice so much......that is probably why. love the cover - it's embroidery (is that the right word?) of the famous Bonnie and Clyde photo (the white bars above and below were added by Amazon). then the lyric sheet is made to look like an old newspaper. pretty cool. I'm a big fan. Especially the song "The Rabbit, The Bat, and The Reindeer"
I have an album or two. I need to listen to them more ... I didn't dislike it, but it also didn't grab me. But, I heard a song of theirs I really like last night, so I have to see if I have it. I think I've heard/read their name somewhere but I had never heard their music before. I really liked some of the songs on their MySpace so I might get their album(s). Thanks for sharing ^^. yeah, i noticed the whole album is up on their Myspace right now. something tells me they'll probably 'blow up' about like Midlake when Van Occupanther came out. they remind me of Midlake at times i think because of the layered harmonies and 'lower-fi' production (i think they have a big part in recording themselves like Midlake as well). i've never seen so many options for buying a record though. i went through their record label and bought a package that included a shirt, sticker, poster and pin. indie record stores have a free 7" with two exclusive tracks. and there's other options, too, i think. after this album sinks in i'll definitely have to delve into their back catalog. Just checked them out for the first time. Thanks for the link, sounds good! i'm not too hot on their music, but their album cover is classy. bonnie parker FTW! i heard of him maybe a year ago ? ish? he has a demo or single on the Architecture in Helsinki single cd for "heart it races" and it's really good. i cant wait to see them in rhode island soon. i've read a few times that they are really good live. one of the singers recently got punched in the throat, so they had to cancel some shows. Thanks for the link, checking them out now! I like the old school feel. I have to say I had heard of them and saw their album cover... but had no clue what their music was like. I just assumed it was a DJ or something. Glad you clued me in! i've listened to the record probably 3 or 4 times all the way through on the road and i really, really like it. not to talk which is maybe the only good thing to come of this mess. changes to the upcoming tour schedule. I like them, Easy Beat is a pretty darn good album. I mean they are a band that sounds like their influences almost to a fault but if you like The Band, the Beatles, the Beach Boys and David Bowie you'll probably get a kick out of them. i keep reading those The Band comparisons. that's one of those bands i haven't checked out. i know they were Dylan's band for a while, but that's about it. and i know about The Last Waltz. just never got around to checking it out. how did the fox get the raven to crow? why did the brother bury his gold?